After trying to change the timing on a newish actopower without the actopower label on the can, I noticed that the engine sparks when testing it, where the brushes touch the rotor, Is this normal? And if not is there a way to stop it? Perfectly normal to get some sparking at the com/brushes. It may calm down a bit after some run time. Maybe try some com drops. Was actually thinking of that motor today, they are rare these days. How does it perform compared to say a dynatech 02H on a 10 turn if you're ever tried that? Ok so sparks are normal that's great. I never really notice since the car is so far away when playing with it. Thanks, it's a motor that I have used on and off for some time, but It was a brand new pink actopower without the actopower label on can. Great motor, super fast on my vintage Terra Scorcher with a 2s lipo. In all honesty I've never used them, but I've been told they can reduce sparking, help lubricate the commutator and brushes. Some of this maybe snake oil but, If you can find a bottle cheaply it could help...maybe. A friend of mine uses Com Drops after cleaning and degreasing his motors or after fitting new brushes. I don't race in any classes where modified motors are used so when my sealed cans are spent they get binned. Community Reminder... these are brushed motors, peoples... brushed motors need regular routine maintenance like skimming the comm on a comm lathe. The hotter the motor the more often it needs servicing. Sparking is unavoidable but every spark is like an arc welder eating away at the copper. Sparks get bigger when your comm is out of true, or its surface roughed from dirt & wear. That SuperMod 11T I'd be looking at rebuilding every 10 runs. "brushed motors need regular routine maintenance like skimming the comm on a comm lathe. " I saw this on one of the manuals for a Pink Actopower, what is this exactly? Nevermind I checked out a brushed motor restoration on youtube, good stuff. I run 2 11t super modifieds in my ta04trf and 414 , a pink acto in my dyna storm and some orion sv2 10t in my schumacher cat 2000. They are fantastic and for some reason I prefer running them to my brushless setups but .... they need a lot of work to keep them in good nick. I take them apart after every 3 or 4 runs to clean and lube. Then every 8 runs I dismantle check and skim if needed. Finding brushes is also increasingly difficult especialy for the sv2 motors with their round brushes. You skim the comm? Do you have a lath? Can you recommend one? My pink actopower start smelling quite bad after I ran it today after trying to change the timing last night, so not sure what I had done. The comm does seem a bit darker now thought not sure. What do you lube the bearing? I was given a Team Orion lathe a while back, I will have to do some reasearch as I haven’t used one before. Want to sell that lathe? Ah, a fellow motor tinkerer! Motor lathes have become cheaper on used market, because people went with brushless. As Willy said, the hotter the motor, the more frequently you'd have to rebuild, because higher RPM creates more high-speed friction. I still like my brushed motors. 22 of my bashers have brushed motors. Only 2 brushlesses. But I'm inclined to think that after about 19t, brushless becomes so effortlessly superior. 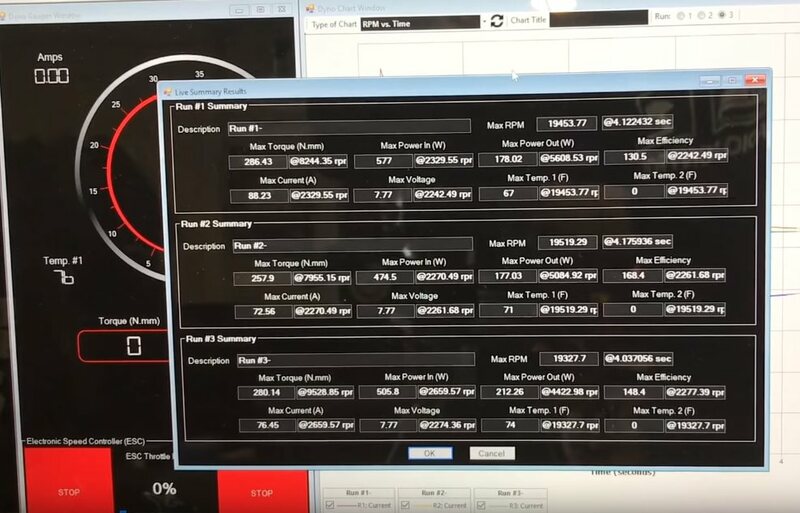 Below is a youtube screenshot of a 17.5t brushless motor. Max torque is 286N.mm. That's 2,916g/cm. Tamiya's stock silver can has 250g/cm. Sport Tuned, GT tuned, Super Stock (similar to Acto), have 500g/cm of torque (Acto has 400g/cm). A brushless has 3,000g/cm. On the other hand, to make 20,000 rpm, 2 brushes have to contact the commutator 40,000 times. For 25,000 rpm, two brushes come in contact 50,000 times. 50,000 sparks rob torque and rpm. If you want speed, you can get a smaller 380 sized 4500kv motor. You lose about half the torque, but that's still more than double the torque of a brushed motor. It will give you 33,300 RPM, without hitting the 60A limit. 8000 rpm faster than Acto. No, scratch that. About 13,000 RPM faster, because brushed motors lose 20% of RPM due to the weight of the car. If Acto says 25,000 RPM, you actually get 20,000. Brushless, however, will hardly lose any RPM, because of the massive torque. This is the reason you don't see many people using 11t brushed motors. 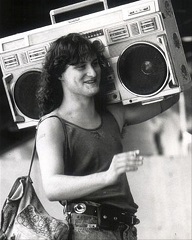 It's kinda like lugging an 80's boombox with a cassette tape, when you can have Bluetooth speakers. One more question, I have put the motor back in the Terra Scorcher, but it seems as though it has less power, I reversed the motor wires and it has the most power in reverse? It has more power in reverse with the wires swapped over then it does with the wires correctly on and front and back acceleration. What's going on? I even reversed the end bell by 180 degrees to see if that would help with the reverse and nothing. Maybe I can somehow swap the forward and reverse on my radio it's a Fly Sky FS GT2B? Yes, try reversing the throttle on your radio.